You subscribe to a theory of "unbalanced" or non-zero sum game design. Could you explain what you mean by this? I was a gamer who invented my own games long before I got into roleplaying. I was, and am, a big fan of escapist literature -- superhero comics, the novels of Edgar Rice Burroughs, the stories of Robert E. Howard. Those stories aren't set up like chess games with balanced forces. They were always the story of a hero against great odds. When I started creating my own games, I did some research during college into game theory, and learned about zero sum games. They seemed to take the whole element of heroism out of the gaming equation. So, if I wanted heroism, I would have to do non-zero sum games. That doesn't mean there is no game balance -- it just means the balance isn't even. If you wanted to win a St. Andre game, you would have to do something that would beat the odds. I wanted games where luck was involved, and I made them. Do you still get the chance to play RPGs today? I don't play nearly as much as I used to. My old circle of friends has moved on. I'm old. I work all the time. I have other things to do. I like to go to SF and game conventions because I usually get a chance to do roleplaying there. I can always run a game on a moment's notice, or drop into some other game the same way. I don't really care about rules so much. I'm happy to roleplay and let the guy who knows the system advise me on what I can do and when. These days I get most of my roleplaying online -- either games I'm running for Trollhalla, like the Rogues Gallery adventure that just ended or Runescape. I take it then that you're a fan of massive online adventure games? I am a big fan of massive online adventure games, in any genre. My dream would be to see Tunnels & Trolls made available as a MMORPG. So do you see computer games as competitors to traditional tabletop RPGs or as a different form of entertainment entirely? In the sense that computer games take valuable time that could be used for face to face gaming, they are certainly competitors. 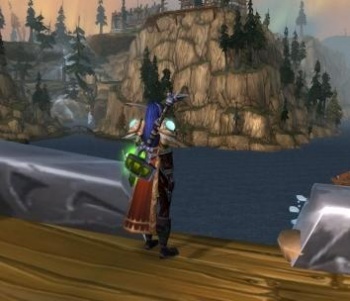 In the sense that some computer games, World of Warcraft for example, are better designed, more colorful, and more exciting than anything your local group of gamers could ever offer, they not only compete, but they blow traditional face to face gaming away. In the sense that you might want to game, but not to deal with people, computer games are greatly superior. On the other hand, no computer game has the imaginative flexibility of a good Game Master, and no sound and fury on a computer screen can paint a better picture than the engaged imagination of a true gamer. James Maliszewski is a writer currently living in Toronto, Ontario, Canada. His blog, Grognardia, explores the history and traditions of the hobby of roleplaying.